Return is calculated using combined bill savings and subsidy earnings. Bill savings are calculated using estimated energy usage and either the electricity price at the time of installation (2 December, 2013) or, for our heating products, the existing fuel type available to the property. With the domestic Renewable Heat Incentive now supporting homeowners who wish to install Solar Thermal (or Solar Hot Water) systems, this product was a viable option. 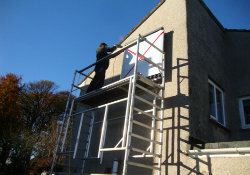 EnergyMyWay recommended and installed a wall mounted 12-tube CPC collector on the South-facing wall. The system will supply approximately 60% of the property’s hot water needs over the whole year, proving Solar water heating is viable, even here in chilly Scotland!